It’s a fact of life: I’m not always right. For example, I have to admit that when I first heard about Tea-Cha, I didn’t think much of it. No, that’s not true: the idea seemed kind of nutty, almost laughable. I mean, here was this very earnest, professor-ish Aussie going on about the science of infusing ground-up tea in a simple little gadget for just a few seconds to make a perfect cup of tea. “HA!” says I, “That’s crazy talk!” I mean, we all know that the only way to make a good cup of tea is to steep loose-leaf teas for anywhere from two or three minutes to seven or more minutes. Small particles of tea? That nasty stuff is for cheap teabags, not for making real tea. Then I tried Tea-Cha. And I’m not laughing any more. In fact, I’ve been using it. Not for every cup or every tea, but this nifty little device definitely has its place in any tea drinker’s repertoire. It’s especially handy when temperatures are hovering in the upper 90s and you’ve got to have iced tea right now. The idea behind Tea-Cha is simple: Take tea leaves, grind them up, then infuse them via drip process for about thirty seconds in the Tea-Cha’s Pet (isn’t that a great name?) funnel and filtering device. This results in a very strong concentrate, which is poured into a teapot, cup, or glass, to which you add hot or cold water to fill. Voila! Near-instant hot or iced tea! Actually, when I thought about it, the concept was not really that alien. If you’ve ever had to prepare tea for a crowd you probably made a concentrate, then added hot or cold water to reconstitute just before serving. Tea-Cha just takes this concept and refines it. And no leaf-per-cup calculations are required if you follow the simple instructions. All you have to do is rest the Tea-Cha’s Pet — a conical device with a handle — on top of the teapot, cup, glass, or (if you won’t be serving it immediately) other container. Then you place a teaspoonful of ground tea leaves for each cup/glassful you want into the device, pour hot water over it, then wait about twenty or thirty seconds for all the water to pass through. Add more or less hot or cold water to the resulting concentrate, according to your taste. If you like, stir in sugar, lemon juice, milk, or whatever else you usually add to your tea. And it’s ready to drink in about as much time as it took to read this paragraph. The key to Tea-Cha is the use of good-quality tea, not the dust and fanning droppings left over from the tea process. If you’re asking the same questions I had — “Why would I want to destroy good tea by grinding it up? Won’t that ruin the flavour?” — the Tea-Cha folks have an answer: When you grind up a good-quality chocolate, whether for drinking, decorating, baking, whatever, doesn’t it still retain its excellent qualities of flavour and aroma? Well, it’s the same with tea. If it’s a good-quality tea, it will still be good tea whether the leaves are big or small. As an added bonus, the Tea-Cha method produces tea super-rich in those terrific anti-oxidants! 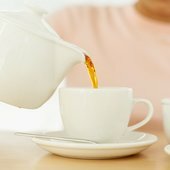 What teas can you use with Tea-Cha? The company carries about a dozen different teas. I’ve sampled a few and they’re fine — some are even quite good. But if you want to use some other tea, you can grind the leaves yourself. I found that grinding the leaves in a coffee/spice mill for about ten or twenty seconds (depending on how big the leaves are to start with) produces the right size and texture. Worked nicely yesterday, for example, with a fragrant jasmine pouchong. And last week with a rich, nectar-like Assam. These are both teas that I’ve prepared in the orthodox style many times, so I’m very familiar with them. And there was no loss of flavour or aroma when they were prepared with the Tea-Cha. You can re-infuse most teas thanks to the rapid infusion process. It even works with teas that don’t normally lend themselves to re-infusion. While Tea-Cha is a convenient gadget to add to your tea ware collection, I think its real value might be in a tea house. Even accounting for the twenty or so seconds required to grind the tea, it takes barely a minute to turn out fresh hot or iced tea — or added in concentrate form to lattes or other tea beverages. 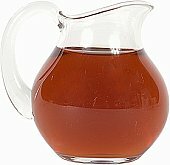 Instead of having only one or two pre-made iced teas each day, a tea house could offer iced tea made with virtually any tea on their shelf without the long wait of steeping and then chilling. Hot teas prepared this way could be served quickly, and without the leaves stewing in the teapot. 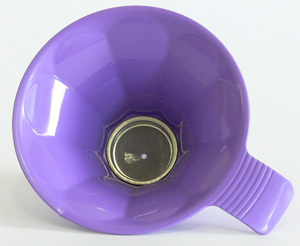 The Tea-Cha website has much more information including a video showing how the device works. And yes, all the science behind the concept. Definitely worth a few moments of your time to take a look. As a bonus, the Tea-Cha’s Pet is available in about a dozen colours. So in addition to its being efficient, you’ll look really cool using it! New! Follow TeaGuide on Facebook!